Basel ( or ; or less often used Basle; German: Basel pronounced ; French: Bâle ; Italian: Basilea ; Romansh: Basilea ) is Switzerland's third most populous city (behind Zürich and Geneva) with about 195,000 inhabitants. Located where the Swiss, French and German borders meet, Basel also has suburbs in France and Germany. In 2014, the Basel agglomeration was the third largest in Switzerland with a population of 537,100 in 74 municipalities in Switzerland and an additional 53 in neighboring countries (municipal count as of 2000). The tri-national Basel metropolitan area has around 830,000 inhabitants in 226 municipalities. The official language of Basel is (the Swiss variety of Standard) German, but the main spoken language is the local variant of the Alemannic Swiss German dialect. 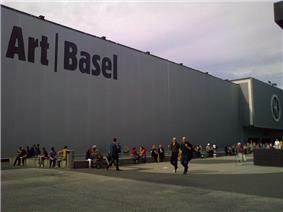 Basel is among the most important cultural centres of Switzerland. The city comprises a large number of theatres and many museums, including the Museum of Fine Arts, the world's oldest art collection accessible to the public. In addition, the Theater Basel was chosen in 1999 as the best stage for German-language performances and in 2009 & 2010 as "Opera of the Year" by German Opera Magazine "Opernwelt". 1493 woodcut of the City of Basel, from the Nuremberg Chronicle. During the days of the Roman Empire, the settlement of Augusta Raurica was founded 10 to 20 km (6 to 12 mi) upstream of present Basel, and a castle was built on the hill overlooking the river where the Basel Münster now stands. But even older Celtic settlements (including a vitrified fort) have been discovered recently in the area predating the Roman castle. The town of Basel was called Basilea or Basilia in Latin (from Ancient Greek Basileia, Βασιλεια meaning kingship) and this name is documented from 374 AD. 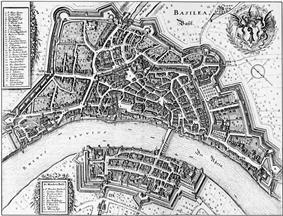 Map of Basel in 1642, engraved by Matthäus Merian, oriented with SW at the top and NE at the bottom. On 9 June 1501, Basel joined the Swiss Confederation as its eleventh canton. It was the only canton that had been asked to join, not the other way round. 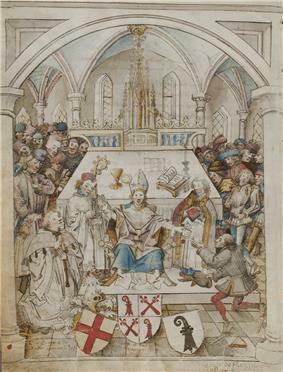 Basel had a strategic location, good relations with Strasbourg and Mulhouse, and control of the corn imports from Alsace, whereas the Swiss lands were becoming overpopulated and had few resources. For its part, Basel secured the military help of the other cantons when threatened, and some protection for its rural subjects outside its walls. A provision of the Charter accepting Basel required that in conflicts among the other cantons it was to stay neutral and offer its services for mediation. In 1544, Johann von Brugge a rich Dutch Protestant refugee was given citizenship and lived respectfully until his death in 1556 then buried with honors. His body was exhumed and burnt at the stake in 1559 after it was discovered that he was the Anabaptist David Joris. There are indications Joachim Meyer, author of the influential 16th century martial arts text Kunst des Fechten ("The Art of Fencing") came from Basel. 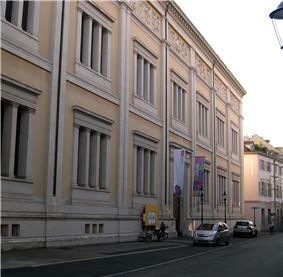 In 1662 the Amerbaschsches Kabinett was established in Basel as the first public museum of art. 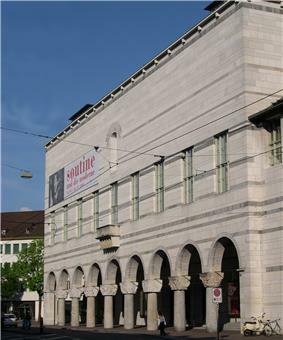 Its collection became the core of the later Basel Museum of Art. The Bernoulli family, which included important 17th and 18th century of mathematicians such as Jakob Bernoulli, Johann Bernoulli and Daniel Bernoulli, were from Basel. The 18th century mathematician Leonhard Euler was born in Basel and studied under Johann Bernoulli. 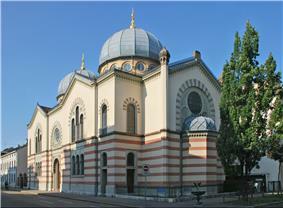 In 1897 the first World Zionist Congress was held in Basel. Basel has often been the site of peace negotiations and other international meetings. The Balkan Wars, the Second International held an extraordinary congress at Basel in 1912. In 1989, the Basel Convention was opened for signature with the aim of preventing the export of hazardous waste from wealthy to developing nations for disposal. A panoramic view of Basel, looking North from the Münster tower over Kleinbasel (Small Basel). The blue tower in the centre, the Messeturm, was Switzerland's tallest building 2003-10; the bridge on the extreme right is the Wettsteinbrücke, Basel's second oldest bridge, but recently replaced by a new structure. The first bridge on the left is the Mittlere Brücke (Middle or Central Bridge), the oldest bridge in Basel. Geo-politically, the city of Basel functions as the capital of the Swiss half-canton of Basel-Stadt, though several of its suburbs are located in the half-canton of Basel-Landschaft or the canton of Aargau. Others are even located in France and Germany. The canton Basel-City consists of three municipalities: Riehen, Bettingen, and the city Basel itself. The political structure and agencies of the city and the canton are identical. As of 2015, Basel's Executive Council is made up of three representatives of the SP (Social Democratic Party), and one member each of Green Party (who is the president), FDP (Free Democratic Party), LDP (Liberal-Demokratische Partei of Basel), and CVP (Christian Democratic Party), giving the left parties a combined four out of seven seats. The last election was held on 28 October 2012. The last election was held on 28 October 2012 for the mandate period (Legislatur) of 2013–2017. Currently, the Grand Council consist of 33 members of the Social Democratic Party (SP), 15 members of the Swiss People's Party (SVP), 13 Grünes Bündnis (GB) (a collaboration of the Green Party (GPS) and Basels starke Alternative (BastA! )), 13 The Liberals (FDP) (the representative of the Aktive Bettingen is associated to the parliamentary group (Fraktion) of the FDP), 10 Liberal-Demokratische Partei (LDP), 9 (8/1) Christian Democratic People's Party (CVP)/Evangelical People's Party (EVP), 5 Green Liberal Party (GLP), and 2 members of the Volksaktion without an association to a parliamentary group. On 18 October 2015, in the federal election the most popular party was the Social Democratic Party (SP) which received two seats with 33.5% of the votes. The next three most popular parties were the SVP (17.6%), the Liberal-Demokratische Partei (LDP) (11.5%) and the Green Party (GPS) (11.2%), each with one seat. In the federal election, a total of 57,304 votes were cast, and the voter turnout was 50.4%. On 18 October 2015, in the federal election Councilor Anita Fetz, member of the Social Democratic Party (SP), was re-elected in the first round as Ständerätin of the canton of Basle-Town with an absolute majority of 35'842 votes. She is part of the Council of States (German: Ständerat) since 2003. Basel has a population (as of April 2015) of . As of 2008, 32.3% of the population are resident foreign nationals. Over the last 10 years (1999–2009 ) the population has changed at a rate of -0.3%. It has changed at a rate of 3.2% due to migration and at a rate of -3% due to births and deaths. Most of the population (as of 2000) speaks German (129,592 or 77.8%), with Italian being second most common (9,049 or 5.4%) and French being third (4,280 or 2.6%). There are 202 people who speak Romansh. As of 2000 the average number of residents per living room was 0.59 which is about equal to the cantonal average of 0.58 per room. In this case, a room is defined as space of a housing unit of at least 4 m2 (43 sq ft) as normal bedrooms, dining rooms, living rooms, kitchens and habitable cellars and attics. :18v About 10.5% of the total households were owner occupied, or in other words did not pay rent (though they may have a mortgage or a rent-to-own agreement). :17 As of 2000, there were 86,371 private households in the municipality, and an average of 1.8 persons per household. There were 44,469 households that consist of only one person and 2,842 households with five or more people. Out of a total of 88,646 households that answered this question, 50.2% were households made up of just one person and there were 451 adults who lived with their parents. Of the rest of the households, there are 20,472 married couples without children, 14,554 married couples with children There were 4,318 single parents with a child or children. There were 2,107 households that were made up of unrelated people and 2,275 households that were made up of some sort of institution or another collective housing. As of 2003 the average price to rent an average apartment in Basel was 1118.60 Swiss francs (CHF) per month (US$890, £500, €720 approx. exchange rate from 2003). The average rate for a one room apartment was 602.27 CHF (US$480, £270, €390), a two room apartment was about 846.52 CHF (US$680, £380, €540), a three room apartment was about 1054.14 CHF (US$840, £470, €670) and a six or more room apartment cost an average of 2185.24 CHF (US$1750, £980, €1400). The average apartment price in Basel was 100.2% of the national average of 1116 CHF. The vacancy rate for the municipality, in 2010, was 0.74%. Basel is subdivided into 19 quarters (Quartiere). The municipalities of Riehen and Bettingen, outside the city limits of Basel, are included in the canton of Basel-City as rural quarters (Landquartiere). EuroAirport Basel Mulhouse Freiburg is operated jointly by two countries, France and Switzerland, although the airport is located completely on French soil. The airport itself is split into two architecturally independent sectors, one half serving the French side and the other half serving the Swiss side; prior to Schengen there was a customs point at the middle of the airport so that people could "emigrate" to the other side of the airport. Basel Bahnhof SBB, self-proclaimed "world's first international railway station." The city of Basel, located in the heart of the tri-border region (also called Dreiländereck) is one of the most dynamic economic regions of Switzerland. As of 2014, Basel had an unemployment rate of 4.6%. As of 2008, there were 18 people employed in the primary economic sector and about 9 businesses involved in this sector. 34,645 people were employed in the secondary sector and there were 1,176 businesses in this sector. 120,130 people were employed in the tertiary sector, with 8,908 businesses in this sector. There were 82,449 residents of the municipality who were employed in some capacity, of which females made up 46.2% of the workforce. Basel has Switzerland's second tallest building (Basler Messeturm / 105m) and Switzerland's tallest tower (St. Chrischona TV tower / 250m). 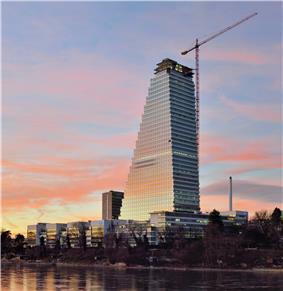 The Roche tower, designed by Herzog & de Meuron and currently under construction, will be 41 floors and 178 meters high, becoming the tallest skyscraper in Switzerland. According to the BIS, "The choice of Switzerland for the seat of the BIS was a compromise by those countries that established the BIS: Belgium, France, Germany, Italy, Japan, the United Kingdom and the United States. When consensus could not be reached on locating the Bank in London, Brussels or Amsterdam, the choice fell on Switzerland. An independent, neutral country, Switzerland offered the BIS less exposure to undue influence from any of the major powers. 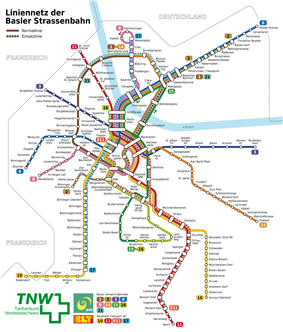 Within Switzerland, Basel was chosen largely because of its location, with excellent railway connections in all directions, especially important at a time when most international travel was by train." Created in May 1930, the BIS is owned by its member central banks, which are private entities. 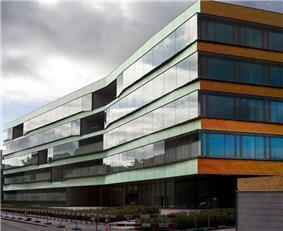 No agent of the Swiss public authorities may enter the premises without the express consent of the bank. The bank exercises supervision and police power over its premises. The bank enjoys immunity from criminal and administrative jurisdiction, as well as setting recommendations which become standard for the world's commercial banking system. Basel is also the location of the Risk Management within its industry. Basler Zeitung ("BaZ"), TagesWoche and bz Basel are the local newspapers. The local TV Station is called telebasel. In 2000 about 57,864 or (34.7%) of the population have completed non-mandatory upper secondary education, and 27,603 or (16.6%) have completed additional higher education (either university or a Fachhochschule). Of the 27,603 who completed tertiary schooling, 44.4% were Swiss men, 31.1% were Swiss women, 13.9% were non-Swiss men and 10.6% were non-Swiss women. Basel hosts Switzerland's oldest university, the University of Basel, dating from 1460. Erasmus, Paracelsus, Daniel Bernoulli, Leonhard Euler, Jacob Burckhardt, Friedrich Nietzsche, Tadeusz Reichstein, Karl Jaspers and Karl Barth worked here. The University of Basel is currently counted among the 100 best educational institutions worldwide. In 2007, the ETH Zürich (Swiss Federal Institute of Technology Zürich) established the Department of Biosystems Science and Engineering (D-BSSE) in Basel. The creation of the D-BSSE was driven by a Swiss-wide research initiative SystemsX, and was jointly supported by funding from the ETH Zürich, the Swiss Government, the Swiss University Conference (SUC) and private industry. Basel also hosts several academies of the Fachhochschule NW (FHNW): the FHNW Academy of Art and Design, FHNW Academy of Music, and the FHNW School of Business..
Basel has five public gymnasiums (Gymnasium Bäumlihof, Gymnasium Kirschgarten, Gymnasium am Münsterplatz, Gymnasium Leonhard, Wirtschaftsgymnasium), each with its own profiles (different focus on major subjects, such as visual design, biology and chemistry, Italian, Spanish, or Latin languages, music, physics and applied mathematics, philosophy/education/psychology, and economics and law) that entitles students with a successful Matura graduation to attend universities. And one Fachmaturitätsschule, the FMS, with six different major subjects (health/nutral sciences, education, social work, design/art, music/theatre/dance, and communication/media) that entitles students with a successful Fachmatura graduation to attend Fachhochschulen. Four different höhere Fachschulen (higher vocational schools such as Bildungszentrum Gesundheit Basel-Stadt (health), Allgemeine Gewerbeschule Basel (trade), Berufsfachschule Basel, Schule für Gestaltung Basel (design)) allows vocational students to improve their knowledge and know-how. Basel counts several International Schools including academia International School, École Française de Bâle, Freies Gymnasium Basel (private), Gymnasium am Münsterplatz (public), Schweizerisch-italienische Primarschule "Sandro Pertini", and Swiss International School (Basel). Basel is home to at least 65 libraries. Some of the largest include; the Universitätsbibliothek Basel (main university library), the special libraries of the Universität Basel, the Allgemein Bibliotheken der GGG Basel, the Library of the Pädagogische Hochschule, the Library of the Hochschule für Soziale Arbeit and the Library of the Hochschule für Wirtschaft. There was a combined total (as of 2008) of 8,443,643 books or other media in the libraries, and in the same year a total of 1,722,802 items were loaned out. Basel calls itself the Cultural Capital of Switzerland. Among others, there is the Anatomical Museum of the University Basel, Berri-Villen and Museum of Ancient Art Basel and Ludwig Collection, Former Franciscan Barefoot Order Church and Basel Historical Museum, Company Archive of Novartis, Haus zum Kirschgarten which is part of the Basel Historical Museum, Historic Archive Roche and Industrial Complex Hoffmann-La Roche, Jewish Museum of Switzerland, Caricature & Cartoon Museum Basel, Karl Barth-Archive, Kleines Klingental (Lower Klingen Valley) with Museum Klingental, Art Museum of Basel with Copperplate Collection, Natural History Museum of Basel and the Museum of Cultures Basel, Museum of Modern Art Basel with the E. Hoffmann collection, St. Alban-Rheinweg 60, Museum Jean Tinguely Basel, Music Museum, Pharmacy Historical Museum of the University of Basel, Poster Collection of the School for Design (Schule für Gestaltung), Swiss Business Archives, Sculpture Hall, Sports Museum of Switzerland, Archives of the Canton of Basel-Stadt, UBS AG Corporate Archives, University Library with manuscripts and music collection, Zoological Garden (Zoologischer Garten). Basel has a thriving cultural life. (In 1997, it contended to become the "European Capital of Culture", though the honor went instead to Thessaloniki) Basel is the home of the Schola Cantorum Basiliensis, founded in 1933, a worldwide centre for research on and performance of music from the Medieval through the Baroque eras. Theater Basel presents a busy schedule of plays in addition to being home to the city's opera and ballet companies. Basel is home to the largest orchestra in Switzerland, the Sinfonieorchester Basel. It is also the home of the Kammerorchester Basel, which is recording the complete symphonies of Ludwig van Beethoven for the Sony label led by its music director Giovanni Antonini. 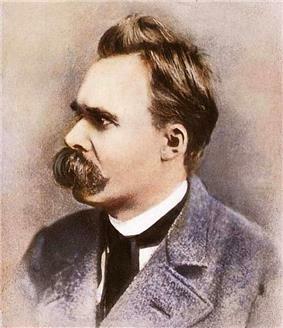 The Schola Cantorum and the Basler Kammerorchester were both founded by the conductor Paul Sacher who went on to commission works by many leading composers. 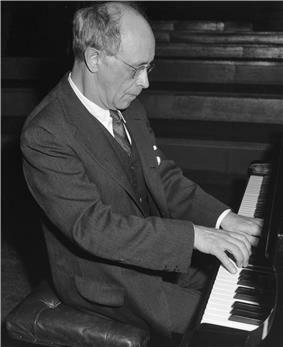 The Paul Sacher Foundation, opened in 1986, houses a major collection of manuscripts, including the entire Igor Stravinsky archive. 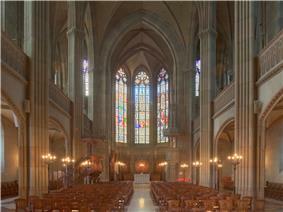 The baroque orchestras La Cetra and Capriccio Basel are also based in Basel. In May 2004, the fifth European Festival of Youth Choirs (Europäisches Jugendchorfestival, or EJCF) choir festival opened: this Basel tradition started in 1992. Host of this festival is the local Basel Boys Choir. The Basel Tattoo and a number of fairs. There are a number of culinary specialties originating in Basel, including Basler Läckerli cookies and Mässmogge candies. Among the most popular sports in Switzerland is Ice hockey. Basel is home to the EHC Basel which plays in the Swiss Premier League. They play their home games in the 6,700-seat St. Jakob Arena. Chiara Banchini (born 1946), violinist and conductor. Karl Barth (1886–1968), Reformed Protestant theologian. Gustav Bertha (Gordon Bell) (born 1969), singer-songwriter. Shemsi Beqiri (born 1986), kickboxer. Alexander Clavel (1805-1873), chemist, pioneer of fuchsine and silk dying. Markus Brüderlin (1958–2014), art historian, curator, writer and director of the Kunstmuseum Wolfsburg. Gottlieb Burckhardt (1836–1907), psychiatrist, father of modern psychosurgery. Jacob Burckhardt (1818–1897), historian, theologian, philosopher. Florian Burkhardt (born 1974), composer, author. Arthur Cohn (born 1927), film producer. Jean Daetwyler (1907–1994), alphorn composer. Eren Derdiyok (born 1988), footballer. Alice Eckenstein (1890–1984), Swiss child rescuer in occupied Belgium during WW I.
Erasmus (c.1466–1536), Biblical scholar, humanist, theologian. Roger Federer (born 1981), tennis player. John Foxe (1517–1587), English Protestant and Marian exile. Alexander Frei (born 1979), footballer. Katy French (1983–2007), model and socialite. Urs Graf (1485-possibly 1530), Renaissance print-maker and artist. Georg Friedrich Haas (born 1953), Austrian composer. Jakob Emanuel Handmann (1718–1781), painter. Johann Peter Hebel (1760–1826), poet and author. Albert Hofmann (1906–2008), chemist, discoverer of LSD. Hans Holbein the Younger (c. 1497- 1543) German painter and printmaker of the Renaissance. Ana Ivanović (born 1987), tennis player. Karl Jaspers (1948 - 1969), German-Swiss philosopher and psychiatrist. Carl Gustav Jung (1875–1961), psychiatrist. Lucius Munatius Plancus (c. 87 BC–c. 15 BC), Basel's founder. Christian von Mechel (1737-1817), engraver, publisher, art dealer. Matthäus Merian 1593–1650, engraver and publisher. Christoph Merian (1800–1858), banker and businessman. Joachim Meyer (c. 1537?–1571), fencer and author. Tadeusz Reichstein (1960 - 1996), Polish-Swiss Nobel laureate. Trudi Roth (born 1930), actress. 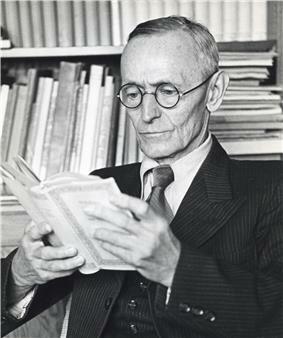 Frithjof Schuon (1907–1998), religious philosopher. Adrian Sieber (born 1972), singer. Hopkinson Smith (born 1946), American lutenist. Andreas Vesalius (1446), pioneering anatomist. Hakan Yakin (born 1977), footballer. Krystian Zimerman (1956), Polish classical pianist. ^ Wood (2006), pp. 285-286, 313. ^ a b c d e f Habicht, Peter, Basel - A Center at the Fringe (Basel: Christoph Merian Verlag, 2006) pp. 43, 55, 70, 79. ^ a b Chen, Aric. "Going to Basel." The New York Times. 11 June 2006. Retrieved on 12 January 2010. ^ "UBS AG in Basel, Aeschenvorstadt 1." (PDF version) UBS AG. Retrieved on 2 July 2010. ^ "Facts and figures." Swiss International Air Lines. Retrieved on 13 June 2009. ^ "Plan interactif." Saint-Louis (Haut-Rhin). Retrieved on 25 September 2009. ^ "Swiss International Air Lines Basel." Swiss International Air Lines. Retrieved on 24 September 2009. ^ "Location." Crossair. Retrieved on 13 June 2009. 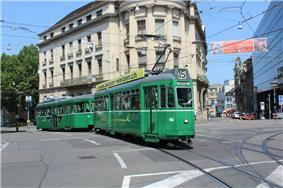 Basel (City) in German, French and Italian in the online Historical Dictionary of Switzerland.